Michael Baumann pitched six innings, striking out three, walking two and allowing no runs on two hits. 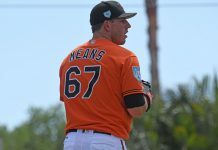 He is the Orioles Hangout MiLB player of the night. Donnie Hart pitched a scoreless inning. Corban Joseph was 3-for-5 with a double and a homer. Keegan Akin pitched six innings, allowing two runs. Alex Wells was pounded for five runs in six innings, He struck out six though. Jomar Reyes went 3-for-5 with a double. Trevor Craport was 3-for-4 with two home runs and a double. He probably should have been co-player of the day.